We love fruit in our household. But it is not just nutritious food for eating. Fruit can be made into jewelry too. 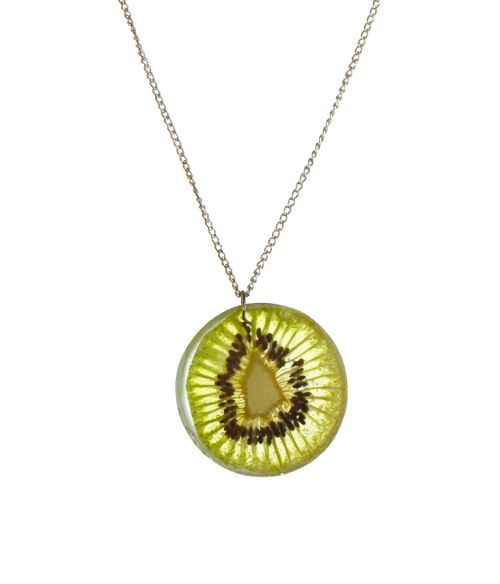 Just like real flower resin jewelry, real fruit jewelry requires the fruit slices to be dried first. Check out this two part tutorial by Allyn of That Girl Who Never Talks. Part 1 shows how she uses a dehydrator to dry slices of fruit. She uses the kind of dehydrator you can purchase for home drying of food. Her tutorial is invaluable as she goes over details like how thin the slices needs to be. These should be 2-3 mm thick not 2-3 cm as in her text. Who knew coating with saturated cornstarch solution before drying helps preserve the color? Just like with real flower jewelry, some experimentation is needed to figure out how long the dehydration process needs to be for different kinds of fruit. Part 2 covers the making of resin jewelry using the completely dried fruit slices. She also submitted her tutorial over on Instructables which is organized differently. Not interested in making your own? You can buy her real fruit resin jewelry from her Etsy store, Raw Design Co.
Great Share pearl, its fascinating to learn about the process. Are there otehr ways to dry fruit instead of using the dehydrator?